Shereen Rankine and Yankjatjara artist Tjula Jane Pole and Kunyi June An McInercy..
ALAS likes this beautiful, sensitive and fitting memorial. There are memorials in other States of Australia which are lovely. We will attempt to show them to you. Please send in your thoughts on what you would like to see in Queensland to represent all people affected by Forced Adoption. 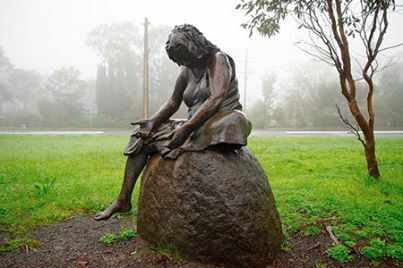 Colebrook Reconciliation Park, Eden Hills Adelaide South Australia. There will be a special meeting at East Leagues Club. Please ring Trish for more details. Our next meeting will be our AGM. 10/8/2013. or Marg; 0402 336 480. for bookings.